You can browse the apps available in the Nokia Store by categories – Applications, Games, Audio and Video content, Personalization; or by collections. Your account profile keeps track of all the apps you have installed under My stuff. You can now also select where games and apps should be installed and where audio and video should go. That’s nice – we wish Android had that right from the start. There are plenty of apps and games; a lot of them free. They are still behind the big players in the app store game, but for a feature phone, having an app store at all is more than we expected. Nokia Asha 300 and 303 owners have an exclusive game waiting for them in the Nokia Store - Angry Birds. It does cost ˆ1 but features everything the iOS or Android versions have. The game runs smoothly on the Asha 300, so no worries here. There is a free demo version pre-installed on the Asha 300 too. The new Asha series shared the spotlight with Lumia and this should be indicative enough of how important the new budget line is. It's obvious that S40 will be playing second fiddle to Windows Phone but Nokia are in no mood to share the low end with anyone. And while Windows Phone is Nokia's hope of clawing back lost ground in the smartphone game, Asha (Hindi for hope) should serve emerging markets where changes are no less dramatic. The four models in the Asha series are obviously aware of the priorities of their target audience. Touchscreen is slowly creeping up the agenda but nothing still beats the basics. Limited budgets make things like messaging and dual SIM almost mandatory. Everything else is optional. And while the developing markets may be ripe already for the optional stuff, the Asha series don’t force a hard choice on potential customers. There's a strong sense of hierarchy in the lineup. And no overlapping of features. With the Asha 303 clearly on top, the Asha 300 is for those who don't need a QWERTY keyboard. Saying no to QWERTY means you need to make do without WLAN too. But you get a better camera. Not that fixed focus is anything exciting, but it doesn't get any better in the price range. Nokia are breaking down the entry level segment into smaller chunks and that's a good way for them to present themselves as the unchallenged leader, the one without alternatives. 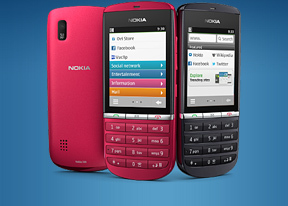 As for the Asha 300, it has a few but most of them are fellow Nokias. With a price tag hovering well below the €100 mark, the Asha 300 is among the cheapest phones to offer a touchscreen. The only handsets we can think of that can match this price are other Touch and Type models. The C2-02 is a basic touchscreen slider with a slightly bigger screen but a lesser camera and no fast data. The C2-03 and C2-06 are… well, just as basic touchscreen sliders with dual-SIM support. The basics, remember? A couple of older Touch and Type phones are well out of the Asha 300's reach. Not only are they impressively built and good-looking, the X3-02 and the C3-01 are better equipped too. They cost a lot less today than they did at launch, more than year ago, but will probably never compete on the same markets as the Asha. Outside Nokia and S40, some of Sony Ericsson's feature phones can be an option to consider. The Mix Walkman or the Cedar come to mind. The Cedar has 3G data speeds, while the Mix Walkman comes with Wi-Fi. One of them hasn't got a keypad, the other omits a touchscreen. Close, but not quite. To wrap up, the Asha 300 is the most likely first upgrade for someone coming from some of the most basic S30 Nokia phones. It can adequately fill in as a backup or temporary handset too. It would've been a lot better with Wi-Fi, but that would've pushed the price up. On the other hand, a 3.5G-capable phone without WLAN must be more attractive to carriers. A carrier-subsidized Asha 300 with a solid data plan sounds like great value for money.